A fax modem gives a computer the ability to connect to a phone line, either for dial-up internet or faxing. Do I already have a fax modem? Why do people still use fax modems? A fax modem is a computer accessory that allows the transmission of data over a telephone line. It can be used for a computer to connect to a dial-up internet server or fax machine. Fax modems can be either an internal modem (attached to the inside of the computer) or an external one (typically connecting through a USB port). Online is currently the best option – some retail outlets may stock one or two models. What else will I need to send and receive faxes with a computer? In some cases (such as with an online fax service) not even a fax modem is needed. When using a Windows or Linux computer, you will need fax software (Windows already includes Windows Fax and Scan) as well as a land-line phone line (VoIP phone lines won’t work). External fax modems connect through a USB port (or similar) to provide the phone line connection. They can be used on either a desktop or laptop and are preferred because they only need to be inserted into the port to be installed. Internal fax modems are either already installed on the computer or can be installed to an internal PCI port to provide the phone line connection. Unless a laptop already has an internal fax modem, it is difficult to install one. Some desktop users prefer their enclosing an internal fax modem in their computer as USB modems are a device hanging off of the main computer. Fax modems work by communicating through an audio signal with the modem or fax machine on the other end of the phone line. To a person, the audio signal sounds like a series of high-pitched computer beeps – to the modem, it’s the way of communicating information between the two computers (or the fax machine). While modems have disappeared from most new computers, they are a feature that is still available. Almost any computer produced since the year 2000 with a port to connect a phone jack (a smaller version of an ethernet port) should have fax modem capability. Fax modems are most commonly used to make a computer a fax machine replacement (connecting it to a phone line) or for dial-up internet connection. Typically a fax modem will cost $15 – 40, depending on whether it is internal or external, and specific features. Will it be compatible with my computer? Operating system compatibility is the biggest question mark when it comes to fax modems. 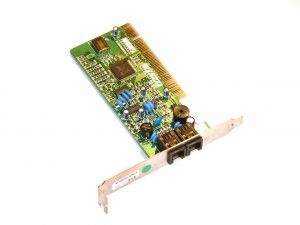 Sometimes having a new operating system makes it more difficult to find a compatible fax modem – as the technology is old, manufacturers are reluctant to develop for the new operating systems. Windows systems are compatible, and there are some modems available for Windows 7 and 8. Apple systems are no longer compatible with fax modems – since the OS X 10.7 update, the Apple modem has no longer worked with the equipment. Linux operating system compatibility is a question mark. While there are modems available, compatibility with the latest version of a specific operating system may not always be quickly updated. Webopedia – What is a fax modem?